The public is taking a second look at Steven Slater, the mercurial flight attendant who cursed out a plane full of passengers and then left the plane through the emergency escape hatch and became a national folk hero. Now it turns out that he may have been an instigator rather than a victim. CBS News reports as follows. Port Authority police are beginning to doubt how true that is. The Journal quotes them as saying none of the passengers told investigators they witnessed Slater being injured. "I think this is moving toward a working theory of, 'It never happened,' the Journal quotes one Port Authority officer as saying. "There are some people who have said he came on board the aircraft with injuries," the officer continued. And police who took Slater into custody told the Journal that, at the time of his arrest, "His eyes were bloodshot, he smelled of alcohol and he was unsteady on his feet." Slater had a lot of problems. His mother is battling lung cancer and he is battling alcoholism. Accounts of Slater being rude to passengers and acting bizarrely are a recurring theme in investigations of the Jet Blue dustup. In addition to suspicions that Slater's account was made up are nagging doubts that Slater's account has anything at all to do with reality as we know it. Slater was supposed to be the latest "working class hero", recklessly acting out a fantasy shared by millions of slapping down (figuratively) a snotty customer. Now it turns out that it may well turn out to be a self promotional stunt. Then there is Newt Gingrich, an articulate and persuasive spokesman for conservative values. His second wife, Marianne Gingrich, (who started out as a side dish while Gingrich was married to wife #1) has dished to Esquire Magazine about her former husband, who has now dumped her and his Baptist faith for Catholicism and a new wife. Divorce is no longer a death sentence to a political career, but hypocrisy is still going strong as a deal breaker for voters. It is already well known that Gingrich went to the hospital to talk divorce details with his first wife Jackie, who was reeling from having just undergone chemotherapy for her uterine cancer. 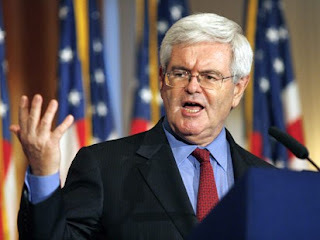 When Marianne Gingrich found herself being replaced by Mrs Gingrich #3, she asked Newt how he could be so cold blooded. Politics Daily quotes John H. Richardson's Esquire interview as follows. "How do you give that speech and do what you are doing?" Marianne asked him. They were in the death throes of their relationship. "It doesn't matter what I do," he told her, according to the Esquire story. "People need to hear what I have to say. There's no one else who can say what I say. It doesn't matter what I live." There are plenty of conservative believers who trust in the ideals but doubt the sincerity of some of its proponents. Gingrich may have the gift of gab, but he gives himself far too much credit. No one is irreplaceable. There are plenty of conservatives who don't feel that liberating America does not have to involve Newtism. Newt Gingrich and Steven Slater have a few things in common. They are both self promoters. They don't mind using and discarding people, whether it is in the aisle of an airplane or in a cancer ward. One is a working class hero, and the other has latched onto patriotism and family values. But neither Gingrich nor Slater believe that the rules apply to them. They are both like passengers on a Ferris wheel who gleefully spit from the top car without paying any mind to the fact that they too will be in the bottom car later on. Any thinking person knows that cashiers, flight attendants and service personnel are not a species apart from customers. We all spend our time on both sides of the service desk. There is a thread of common humanity that binds us together. People like Gingrich who exempt themselves from laws that they inflict on the public and people like Slater, who view an aircraft full of passengers as bit players in their personal psychodrama are flip sides of the same coin. They have a book full of rules for everyone else and a book full of excuses for themselves. I really wanted to have confidence in Gingrich. I also wanted to believe that Steven Slater was an avenger by proxy for all the people who are treated like serfs by unappreciative customers, passengers and citizens. But it appears that both men are using an ideal and the projected wishes and beliefs of the public for their own aims. Whatever we believe, there will be users like Slater and Gingrich who hijack our dreams to their own private destinations.We too struggle to live up to ideals that demand much of us. The important thing to remember is that ideal don't die when people fall short of them. The best we can do is to strive for perfection through imperfect means.